Yellow color is related to Solar Plexus. This Chakra is situated below the ribs. The organs linked with this Chakra are small intestine, stomach, liver, spleen. The endocrine gland linked to this center are pancreas. At the spiritual and mental level, yellow color is related to the individuals own evaluation. How a person feel for himself and, what perception he has for others. This Chakra is concerned with the area of a person’s personality. A person’s ego, his wisdom and understanding and assessment of his confidence is based on this Chakra. If yellow color, is balanced in a person, he is generous, open minded and big hearted. He will be good natured and gentle. Will be able to convince others. Will know how to analyse things and will be analytical. Will be intelligent. He is going to be optimistic, and he will have a depth in his words. Will be skillful in reasoning and would be a logical person. He will be intellectual. 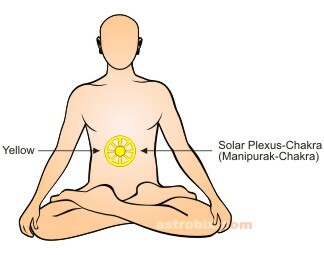 If, the Solar Plexus chakra is unbalanced in an individual, then he will be hostile. Will have a nature of flattering others. The person may have a sense of inferiority. He might be a coward. He may try to be cunning, show duplicity and shrewdness. If, a person has unbalanced amount of yellow color, then the disorders caused are:- diseases related to liver, stones in gall bladder, diabetes, pancreatitis, peptic ulcer. Yellow is one of the last three colors of visible rainbow. This is a warm color and has a stimulating effect. Yellow color shows good intellectual sense and is useful in matters of education and teaching. This color proves to be helpful at the places where concentration is required. Include a yellow colored clothing item or accessory in your attire regularly. Keep a yellow colored piece of crystal or glass in your workplace, or in your home. Use a yellow colored night-dress so that you may benefit from the energies while you sleep. Use yellow colored bulb or night-lamp. If you don’t find a yellow colored bulb, you can use a yellow colored film to wrap around a regular white bulb. Include yellow color in your home furnishing. Visualize the yellow color in your head during the day.